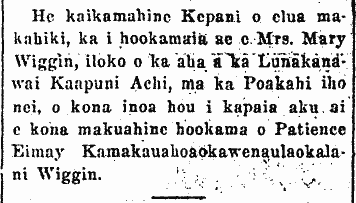 George M. Keone reports the latest from Ewa, 1913. Eha i ka makili kui a Kaulumano. From “The Auntie of the Bishop Museum,” Honolulu Advertiser, August 17, 2005, Pages E1, 3. Wishing Aunty a happy birthday. E o e Kuini Kapiolani! 1898. Na Eha Hua hiu a Wela. Ka Loea Kalaiaina, Buke II, Helu 30, Aoao 4. Iulai 30, 1898. DON’T BE INDIFFERENT TO GOOD WORKS. Patience Wiggin is a Japanese baby who is two years old. She was born on Kauai. There are many children in her family, and ten days after the birth of this little girl, her mother passed away. Her father is poor. After fighting with destitution and troubles, he returned the tiny girl to the Children’s Hospital, for he knew he could not care for this child. The news was told to Miss Lucy Ward about Patience. Her job is to find homes for children like this small girl. So she began to go around searching for a home. She found Mrs. Wiggin, a Hawaiian, who wanted to adopt [hookama] a child. Mrs. Wiggin’s mind was delighted to find a baby of a different ethnicity, and welcomed in Patience. So the young girl gained a fine home and a kind mother. The Humane Society is one of 23 associations that is provided with funds that are collected for United Welfare [Pono Lokahi] drive. This is something which promotes good will between the different ethnicities of Hawaii nei, and it will provide homes for Japanese orphans and also for children of other races. Efforts to raise funds will begin on November 28 and continue for two days. This year the goal to be collected is $275,000, and from that sum, the Humane Society will receive $2211. [For and earlier post, click here. And for even more on Aunty, click here. E o, e Namaka! 1921. A Japanese girl of two years old was adopted by Mrs. Mary Wiggin, in the court of the Circuit Court Judge Achi, on this past Monday; her new name that she is being called by her adopted mother is Patience Eimay Kamakauahoaokawenaulaokalani [Namakauahoaokawenaulaokalaniikiikikalaninui] Wiggin. See much more in Nanea Armstrong Wassel’s Instagram post! Ka Nupepa Kuokoa, Buke LIX, Helu 33, Aoao 4. Augate 19, 1921.